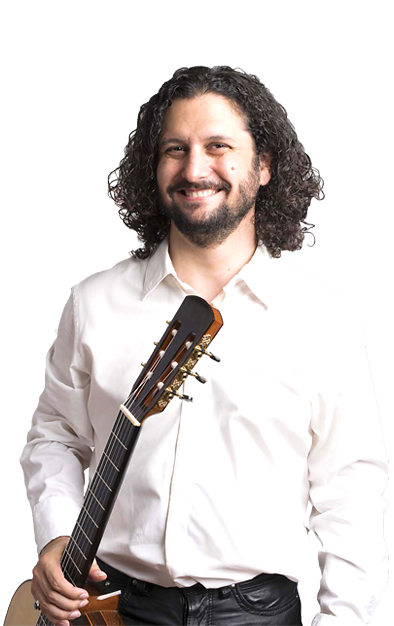 "Aaron is a unique talent not to be missed"
Noted for his “astounding technical proficiency and artistic delicacy” (Boston Musical Intelligencer), classical-world guitarist Aaron Larget-Caplan is an international touring and recording artist. He has performed solo and chamber music in Russia, Europe and across the United States including El Palacio de Linares (Madrid, Spain), Yelagin and Sheremetev Palaces and the St. Petersburg Conservatory (Russia), Mantova Chamber Music Festival, Corte Eremo and Castillo de Galeazza (Italy), Crocker Art Museum (Sacramento, CA) and Jordan Hall, (Boston, MA). At the age of 16 he made his debut at the Tabor Opera House and has since premiered over 65 solo and chamber compositions, performed with orchestras, created commissioning endeavors, directed concert series and brought classical music into schools and community settings. A gifted performer and speaker, he is sought for his deft programming of new and standard repertoire while connecting with audiences with a Bernstein-esque ease. Aaron’s solo and chamber music recordings are issued on Stone Records “The legend of Hagoromo” (2015), Albany Records “Vientos – Music of Hayg Boyadjian” (2010), Parma Recordings “Perceptions” (2011), and his own Six String Sound “Tracing a wheel on water” (2006) and “New Lullaby” (2010). They have received critical acclaim from Audiophile, Fanfare, American Record Guide, Guitar Magazine and many more with such response as “stunningly played” (Fanfare), "eclectic and endlessly rewarding release" (Classical Guitar), “A Significant Recording” (Classical Guitar UK). Aaron is the founder of the acclaimed New Lullaby Project, a 21st century commissioning endeavor that invites composers to write classical miniatures in the genre of the lullaby. Begun in 2007 as an impetus to bridge the fear of contemporary music with audiences and the guitar with composers, he has since premiered 52 by over 49 different composers from six countries. The debut CD “New Lullaby" Features 14 new lullabies by 13 American composers. The New Lullaby Project continues to premiere new solos and work has begun on a second CD. In concerts and recordings, Aaron utilizes many of his own arrangements of J.S. Bach, Domenico Scarlatti, numerous Spanish composers and the American John Cage. His arrangement of John Cage's “Six Melodies” (2015) for violin and guitar is published by Edition Peters, and is the first officially sanctioned work in the Cage catalogue to feature guitar. A collection of solos "Piano Music for Guitar" is being released in October 2017 by Edition Peters. Aaron recently received exclusive permission from Édition Musicales Alphonse Leduc to perform his arrangements of Reynaldo Hahn’s “Mélodies”(2016) for voice and guitar. As a chamber musician Aaron has performed works for small and large ensembles including with choir, string quartet, duos of all types and mixed ensembles. Recent collaborators include the Rimsky-Korsakov and New England String Quartets, Boston Lyric Opera, Schola Cantorum of Boston, Musica Sacra, New Holland Ensemble (Russia), violinists Irina Muresanu and Sharan Leventhal, and cellist Rafael Popper-Keizer. Aaron is the founder of the ensemble ¡Con Fuego! (With Fire! ), which juxtaposes classical Spanish music and flamenco dance and song. The programs cross-fertilize the passion and raw energy of flamenco with the harmonic and timbre variety of Spanish classical masters, featuring award winning choreographers, dancers and singers La Conja and Gabriela Granados. Aaron’s published articles include: “Have Guitar, Will Travel – To Russia With Love”, The Triangle of Mu Phi Epsilon (2015), and “Meet the Luthier with Sicilian Builder Franco Marino”, Boston Classical Guitar Society Quarterly (2010). Interviews of Aaron include “Building a career through talent and savvy”, The Triangle (2011), and “On the Trail with Lullaby Hunter, Aaron Larget-Caplan”, Fanfare Magazine (2011) where he was noted for his“enthusiasm and virtuosity”. He has given lectures Being an Artist Entrepreneur and Creating Commissioning Projects at universities as well as the Guitar Foundation of America (2016) and for the international music fraternity ΜΦΕ (2017). Aaron has appeared on numerous radio and television stations across the US. From 2010-2014, Aaron founded and directed Greater Boston House Concerts, presenting classical music in salon settings in the Dorchester neighborhood of Boston. Featuring artists from the Boston Symphony and across the USA, Italy and Germany, highlighting living composers, duos and world-class soloists. A proponent of live classical music in society and arts in education, Aaron is a former roster artist with Young Audiences of Massachusetts, for which he was the youngest ever chosen. He continues to give enrichment programs and artist residencies alongside formal concerts throughout the country and internationally, introducing classical music into schools and community venues in solo, duo and Spanish dance programs. His Spanish, Latin American, Japanese and Contemporary music programs have received awards from the New England Foundation for the Arts, New England Conservatory and numerous cultural arts councils. Of special note is a week-long arts residency in Northern New Hampshire performing in 13 school programs, giving three workshops and three formal concerts across 900 miles of the State. He has received awards and grants from the American Composers Forum, New England Foundation for the Arts, American Composers Alliance, New England Conservatory, D’Addario Foundation, Mu Phi Epsilon Foundation, numerous Local Arts Councils, Hartford Performs, and in 2014 he was awarded as an I.D. LOTT –Identifying Future Leaders of Today and Tomorrow for his artistic and community work in Dorchester. As an educator Aaron is currently on faculty at the University of Massachusetts Boston and formerly at the Boston Conservatory. He has an active private studio and past positions include the New School of Music and Community Music Center of Boston, as well as classroom positions at Bay Path College and the Fenn School. He has given master classes, workshops and lectures at: Tufts University, Boston Conservatory, University of Las Vegas, CSU Bakersfield, Wheaton College, Suffolk University, University of Memphis, Adams State College, University of Vermont Burlington, Suffolk University, Salem State University,University of Massachusetts Boston, Moscow University of Arts and Culture, Russia, the New England Classical Guitar Society, and the Boston Classical Guitar Society. Aaron is a graduate of the New England Conservatory, where he studied with David Leisner and received awards for his chamber music and outreach performances. Following the Conservatory he studied for seven years with Russian guitar pedagogue Dmitry Goryachev and received additional coaching from Juanito Pascual (flamenco), and pianist Seymour Bernstein. He studies body geometry and physic in its relation to music through Cathar Yoga with his wife Catherine, and is learning French and Spanish while exploring and drinking espresso. Aaron performs on a 2009 Olivier Fanton d'Andon guitar He lives in Boston with his wife, healer and muse, Catherine. With close to twenty years of private teaching experience Aaron works with students of all levels and abilities. Through repertoire and exercises students focus on sound production, ease of motion and performance practice. He introduces body awareness, stretches and strengthening of the hands and arms, and mental preparation for whichever stage we choose to perform on. Aaron's private studio lessons are held at his residence. 60, 90 and 120-minute lessons are available. All-ages are welcome. A studio recital is held once to twice a year. Online lessons available via Skype. *Contact Aaron for availability and pricing. Since his teenage years on the Speech team, Aaron has received awards for his music, creativity, projects, and community work.